When in Vermont, do as the Vermonters do. You may have come to the North in search of ice, but while you’re here, may we humbly suggest you try the ice cream. Ben & Jerry’s – purveyor of rich, creamy, auspiciously-named frozen treats in the dairy section of your local grocer – got its start right here. From its humble beginnings grew an ice cream empire. And when you have an empire, you’re going to need a factory. 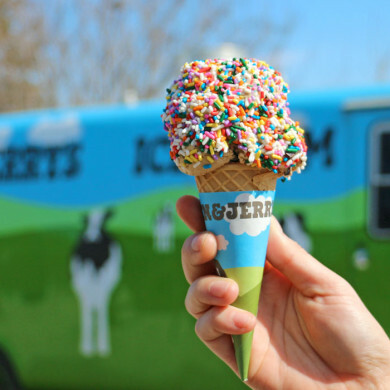 The Ben & Jerry’s factory stands just a short drive from our Killington hotel, in Waterbury. The 30-minute guided tour shares secrets of ice cream manufacturing, as well as the values that guide the decades-old business. Obviously, there is a taste-testing portion of the tour. It’d be cruel and unusual not to have one. In the scoop shop, you can sample old and new favorites, before exiting into the Gift Shop for a T-shirt to prove you’ve been here. Tickets are first-come, first-serve – and a bargain at only $4 per adult, $3 per senior and free for children 12 and under. The Factory is closed on Thanksgiving, Christmas and New Years Day. For more information, visit the Ben & Jerry’s website. The Ben & Jerry’s Factory is located at 1281 Waterbury-Stowe Road, Route 100 Waterbury, VT 0567. For more information, visit the Ben & Jerry’s website or call (866) 258-6877.